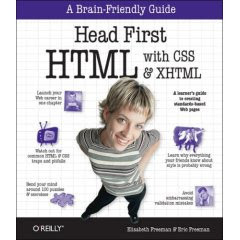 I was thinking to read a book to improve my HTML skills for very long period and finally i bought a book “Head first HTML with CSS & XHTML” by Elisabeth Freemen and Eric Freeman. I have read half of this book now and i should say its pretty good. I have read lots of HTML tutorials on the web and no one has helped me understand HTML the way this book has. Presentation of this book is very different from the regular books thats make learning easy to remember. If you are considering reading an HTML book have a look at this book before buying another.